Hengkai provides good custom services on laser cutting decorative panel and metal screen. calcuate the cutting length to quote prices within 12 hours. In our stock, stainless steel 304,316, mild steel, galvanized sheet, aluminum sheet are available. 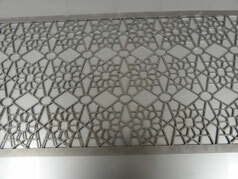 If you special requirements please tell us, we can purchase other materials to cutting for you. More detail please contact our services.